Fahrenheit is a game about weather, featuring positive and negative temperature values ranging from –32° to +32°. Using temperature value cards and weather wildcards, the temperature rises and falls throughout each round of the game and at the end of each round you are given a personal temperature score. See our How to Play section to learn more. guided math stations and the kids are having a blast with it! Thank you so much! The kids beg to play it all the time. like games but this one was a hit even with him! My husband and I love it! We play it together, just us mostly, and I like that it's still very fun and competitive with us two, though it's also great in a group of 4-6. It usually takes me forever to learn a new card game (which takes the fun out for me, usually, always spending time relearning), but with Fahrenheit I caught on fairly quickly, spending more time enjoying it!! The anticipation for your next card is always fun (and often funny!) as it could be the instantaneous rise or fall of your success that round!! All of our family has spent hours playing this game. We love it! We really enjoy the feature of having to follow temperature! It will for sure be a staple at family gatherings! Very fun game!! Already had lots of fun with friends!! Highly addictive, and I love the fun competition!! Great game! Not only does it keep you thinking but it's fun as well. I played it with my cousin and grandpa, and it is a wonderful game for all ages. 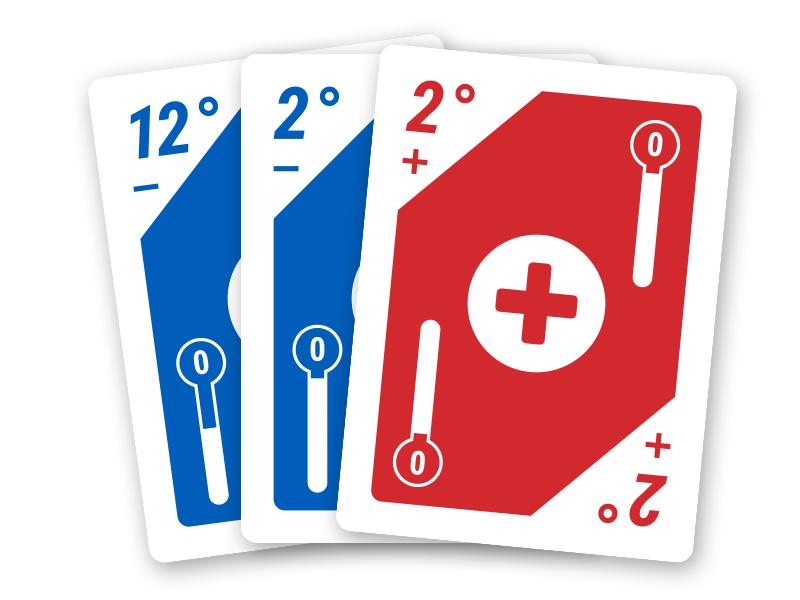 Each deck consists of blue negative value temperature cards ranging from –32° to –2° and red positive value temperature cards ranging from +2° to +32° as well as five different wildcard types (Warm Front, Cold Front, Zero, Forecast, and Frost) that affect the direction of the temperature. The full deck contains 84 playable cards: (2) cards for each of the 32 temperature values—16 positive and 16 negative and (4) cards for each of the five wildcard types. For scoring purposes, each temperature value card is worth its value–positive or negative. Red wildcards (Warm Front and Forecast) are worth +20, while blue wildcards (Cold Front and Frost) are worth –20. The Zero wildcard is neutral and can be applied either as +20 or –20 at the player's discretion when scoring the round. Temperature value cards can be positive or negative. The cards shown to the left are arranged left-to-right coldest to warmest. Example: If the active temperature in the center area of play is –6° and the temperature direction is getting warmer, either the –2° or +2° cards could be played as they are warmer than –6°. The –12° card is colder than –6° and could not be played. There are five different kinds of wildcards in Fahrenheit. Cold Front and Warm Front cards change the direction of the temperature within a round. Playing a warm front card will cause the temperature to begin getting warmer, meaning that all cards played after it must be warmer than the current temperature. The Zero wildcard resets the current temperature to zero and the player using the wildcard can determine whether the temperature should get warmer or colder from 0°. When the Frost wildcard is played, it skips the next player's turn. The Forecast wildcard is played alongside a temperature value card, setting the new active temperature and direction for the round. Example: The Forecast card is played along with a –24° temperature card and the player says "It's –24° and getting warmer." A game of Fahrenheit consists of a predetermined number of rounds (usually equal to the number of players) where the ultimate goal is to keep your personal temperature score closest to zero after all rounds are completed. To begin, an initial dealer is chosen and each player is dealt 5 cards to hold in their hand. The remaining cards in the deck are then placed at the center of the play area and the top card is flipped over to determine the starting temperature. If the starting temperature is a positive value, the round begins with the temperature direction "getting warmer". If the starting temperature is a negative value, the round beings with the temperature direction "getting colder". The round ends when a player runs out of cards in their hand. Using the initial temperature as reference, players take turns playing cards out of their hand, following the direction of the current temperature. At any given time there is an active temperature value card in the center of the play area, and an active temperature direction that applies to the round. Example: The current active temperature displayed in the center play area is +20° and the direction is that the temperature is getting warmer. Only cards with a temperature value greater than +20° or wildcards may be played. At the end of each round, there will be a player that runs out of cards in their hand. This results in a round score of zero which is then added to the player's cumulative game score. For all players that end the round with cards in their hand, a round score is determined and added to each player's cumulative game score. Temperature value cards are scored at face value–either positive or negative–and wildcards are scored as either positive or negative 20 depending on the card(s). Example: A player that ends the round with the cards shown at left in their hand (–12°, +6°, and +30°) would have a round score of +24°. There are no wildcards, so each card is scored at face value. Because the ultimate goal of Fahrenheit is to keep your personal temperature game score closest to zero, it may not always be in your best interest to finish a round with a score of zero. If your personal game score after four out of five rounds is at +22°, being the player to run out of cards and finish the final round with a score of zero may or may not get you the overall win. In the scenario shown at left, Dave's score after four rounds is –16°, which is closer to zero than Sara's +22°. It would be in Sara's best interest to try to finish the final round with a few negative value cards that add up to –22° as close as she can manage. One morning, while getting ready for work and eating breakfast, I told my wife about an interesting dream that I had experienced the night before. The dream was unusual and very clear and is clear in my memory to this day. In the dream, I was walking through the halls of a school building where there were many empty folding tables set up. I was with a fellow that I did not know, but he reminded me of a friend that had passed away early in life. We stopped at one of the tables and he asked if I wanted to play a card game. I asked him the name of the game and he said, “It is the weather game”. We sat down at a table, and he started to show me the game when I woke up. We didn’t actually get to play, but I understood the concept well enough to get up in the middle of the night and write down some notes from the dream. I went to work that day and thought about the game and how to bring it to life when I got home. With the ideas of the game in mind, I made a crude copy of the deck with a felt marker and a deck of poker cards that night. My wife, two young sons and I played the game that night and we've been playing it ever since. Fahrenheit™ has always been a family project for us. We were blessed to have my oldest son get a degree in Graphic Design many years after my dream, and took advantage of that degree to design the cards and packaging. The dream that inspired the game was about 15 years ago now, and the game has been tested by many families in that time, but now it is ready to be shared with everyone that enjoys playing games with friends and family around the kitchen table. This is a simple card game that involves luck and strategy, but mostly it's just fun!